These Belleek mugs were introduced in 2014. 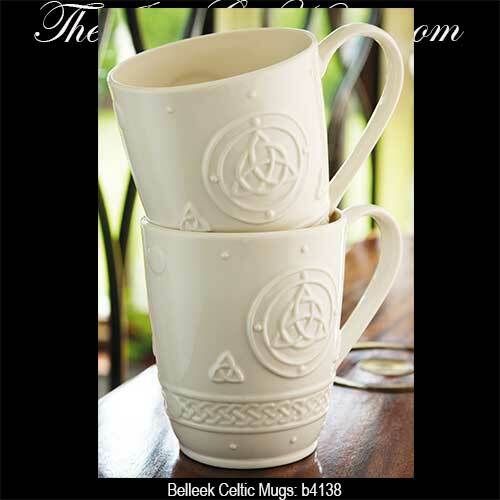 Both sides of these Belleek mugs feature embossed Celtic knot-work that includes the Trinity. 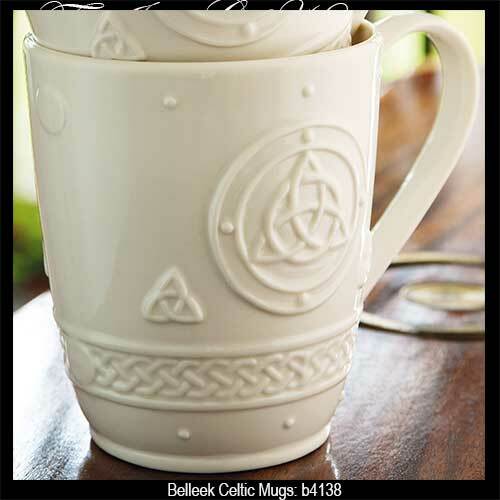 The pair of Celtic mugs are made of fine Irish china and measure 4" tall. The Belleek China mugs hold 10 ounces and are safe to use in the dishwasher along with the microwave oven. This Irish dinnerware is hand crafted in Belleek, Ireland and is gift boxed with a Celtic knot history card, complements of The Irish Gift House. This set of four Belleek mugs were inspired by the Arts and Crafts movement.